Real estate sector in India has serious environmental implications. How effective are regulatory agencies? Increasing urbanisation and favourable demographics have resulted in the real estate sector turning into an appealing investment opportunity for domestic as well as foreign investors. According to the 2011 Census, 31.16 per cent of India is urbanised. Residential, commercial and corporate buildings continue to grow at a considerable rate. But what about their impact on the environment? The environmental effect of real estate projects is visible during their construction as well as operational phase. As the country debates the saga of Lavasa housing project, the booming real estate sector is gradually changing its urban landscape. 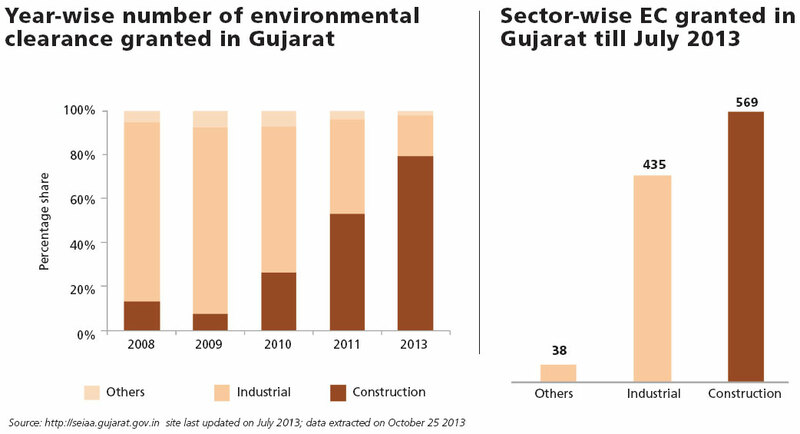 Take the case of Gujarat, one of the most urbanised (42.6 per cent) states in the country as per the 2011 Census. The state has had a real estate boom since 2010 with an unprecedented increase in environmental clearances granted to real estate projects (See graph on p54). 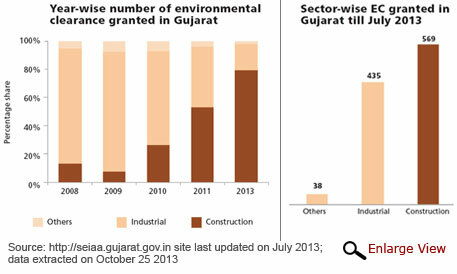 The construction sector was the beneficiary of more than 50 per cent of environmental clearances granted in the state till July 2013. The Government of India started using environmental clearance and Environmental Impact Assessment (EIA) as environmental management tools way back in 1994. But it was only in 2006 that it recognised the growth and environmental consequences of the real estate sector. The Ministry of Environment and Forests (MoEF) introduced threshold limits for construction projects in the EIA notification issued that year. As per the notification, building and construction projects with a construction area more than or equal to 20,000 square metres (sq m) come under the purview of environmental clearance. Townships and area development projects with an area more than or equal to 500,000 sq m or those with a construction area more than 150,000 sq m come under the purview of EIA. Interestingly, the notification prescribes that the former category requires EIA only if the construction area is more than 150,000 sq m.
The environment ministry appoints State Expert Appraisal Committee (SEAC) and State Environment Impact Assessment Authority (SEIAA). The former is an appraisal body, while the latter has authority to grant environmental clearance. The project proponent first needs to get the consent of urban local bodies (ULBs) to establish the project and only then can it apply to SEIAA for environmental clearance. After reviewing the project proponent’s application, the agency forwards it for SEAC’s appraisal. SEIAA grants in-principle environmental clearance after getting the green signal from SEAC. Once a project is cleared, as per guidelines, the project proponent has to submit half-yearly monitoring reports to the authorities concerned. 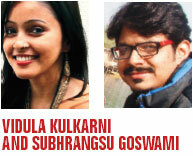 Does less built-up area pollute less? With an increasing number of construction projects getting clearances from state-level agencies, it is important to analyse if the clearance process is comprehensive in assessing the impact of real estate projects on the environment. It is also important to understand if the clearance process holds project proponents responsible for mitigation of adverse environmental impacts of construction projects. The EIA Notification, 2006, suggests that a project requires EIA only if the construction area is more than 150,000 sq m. Many environmental experts in the country are at loss in understanding the rationale behind this area criteria. The criteria is apparently based on the understanding that construction projects with a larger area have greater environmental impact. Therefore, it is important to examine if there is a correlation between the scale of a project and its impact on the environment. This can be examined from two perspectives—resource consumption (water demand and energy demand) and pollution potential (solid and liquid waste generation as well as air pollution). Commercial buildings like shopping malls and multiplexes, compared to a residential apartment with a much smaller area, consume more energy because of high air conditioning, lighting (even during the day) and use of escalators. As far as waste generation is concerned, these commercial buildings house many shops and restaurants which generate huge amounts of waste. The third important aspect is parking and related nuisance. Most of these commercial buildings do not have enough parking spaces. Visitors, therefore, tend to park their vehicles on the main roads or bylanes. Such unauthorised parking leads to congestion, resulting in slow movement of traffic, increased travel time, air pollution and noise pollution. As per EIA notification guidelines, the project proponents need to submit two forms—1 and 1A—to SEIAA for environmental clearance. These forms require important information based on which the environmental impact of the project is assessed. But most proponents do not fill these crucial bits. For example, many proponents do not disclose the total amount of water required during the construction and operational phases of the project. Some indicate that water will be supplied by the local authority. Same is the case with waste water generation. In practice, many of these projects end up using groundwater which requires drilling borewells at the site. This is because most of these projects come up at the outskirts of a city with sufficient space but inadequate water supply and sewage network. This is a common practice in rapidly urbanising Ahmedabad, where groundwater is depleting and as per the Central Ground Water Board of Ministry of Water Resources, no groundwater extraction should be allowed. As part of the environmental clearance process, project proponents have to prepare an Environmental Management Plan to ensure minimum environmental damage from the project. But if one goes through several EMPs, one realises that all of them read more or less the same, irrespective of the nature and scale of the project. In fact, a number of good environmental management practices are proposed in the EMPs without proper understanding of their feasibility. Some environmental safeguards proposed in the management plans include measures like sprinkling water to avoid dust and having a green belt by planting trees to reduce pollution. In most projects, such measures are non-existent at the site. Rainwater harvesting is almost always proposed in EMPs. The project proponents belabour to show that rainwater harvesting structures are installed. But they do not care to ensure that these structures function well and are properly maintained. The project proponent usually retains ownership of commercial buildings, while in case of residential projects, the developer hands over all responsibilities to the residents or the housing society. A majority of the residents do not have proper knowledge about the technicalities of the environmental clearance process and the proposed EMP. In many cases, they are unaware of the operational and maintenance costs of the available facilities. Moreover, the monitoring mechanism for real estate projects is weak. As a result, EMPs fail to achieve the desired goal. The process of environmental clearance tends to address issues related to individual projects. The cumulative environmental impact of many such projects is never assessed. One of the most adverse consequences is visible on the roads in terms of increasing traffic and on-road parking. This has other multiplier effects like air and noise pollution, increasing accidents and, most importantly, very little space for safe movement of pedestrians and cyclists. The carrying capacity of a road is never taken into account while clearing real estate projects. 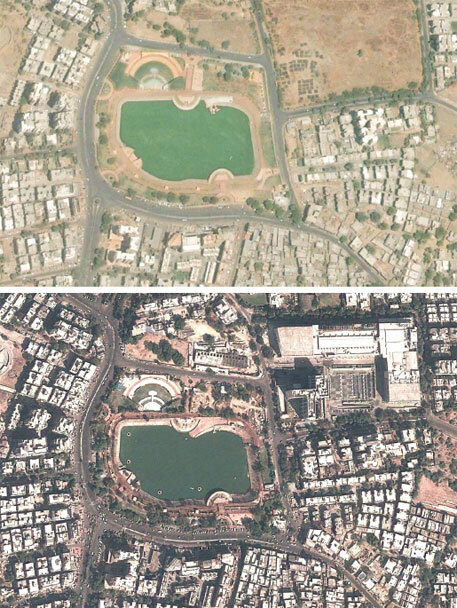 A few satellite images of Vastrapur area in Ahmedabad (see p 53) show how the real estate sector is changing the urban landscape. 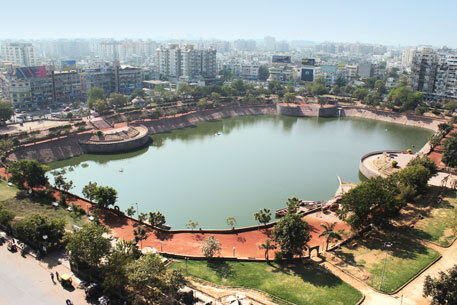 Vastrapur Lake was beautified by the Ahmedabad Municipal Corporation in 2002 to provide green infrastructure and entertainment. AlphaOne Mall, covering an area of 35,000 sq mt adjoining the lake, was opened in 2011. As the images show, there has been a significant rise from 2006 to 2013 in the number of low-rise and high-rise apartments adjoining the lake. Today the roads in the area are congested with people and vehicles. It is important to question the kind of EIA that was carried out while granting environmental clearance to such construction projects in an otherwise peaceful area. The very purpose of environmental clearance is to minimise environmental damage caused by a proposed project and to safeguard the quality of life. It is somewhat of a travesty of justice that construction projects do not require public consultation at any stage of environmental clearance. As a result, the harmful effects of such projects on people living in the vicinity are never accounted for. The clearance authority is very often under pressure to appraise too many projects in a short time. This results in weak appraisal and overlooking of important questionable information provided by the proponent. Moreover, ULBs— corporation/municipality—and their planning departments are supposed to be the most informed authorities on any new development in the city. But they are hardly represented in SEACs and SEIAAs. So while the real estate sector in the country continues to boom, the many loopholes in the clearance process, shoddy implementation of EMP and poor monitoring mechanism defeats the ultimate objective of environmental clearance for urban projects. Vidula Kulkarni is an environmental planner and programme officer at Planning Resources for Urban Affairs wing of the Pune-based All India Institute of Local Government. Could anyone tell me how much GHG is generated in the construction phase of a multi storey typical apartment? the land area of india is 3,287,590 kmâ”¬â–“ , out of that only 100,000 thousand and odd square kilometer is the area under 7,935 towns. If we take the 46 million plus cities where more than 75% of the urban population that we are terming as curse is located, the curse was committed by the urban planners and the EIA specialists under the garb of a law called EPA act. Urbanisation is nether a bane nor a curse, the professionals who practice the urban, who could not withstand the onslaught of hippocrites who push things in the name of development to be blamed. Please, find a way for the paradigm shift, get off this socialist-phobic horse to blame anything and everything on urbanisation. It is amazing that human beings have learnt to exploit economies of scale and agglomeration for the benefit of human kind. Think about we have to travel 300 to 400 miles like everyday on the faster lane as in americas to reach our destination( office)?